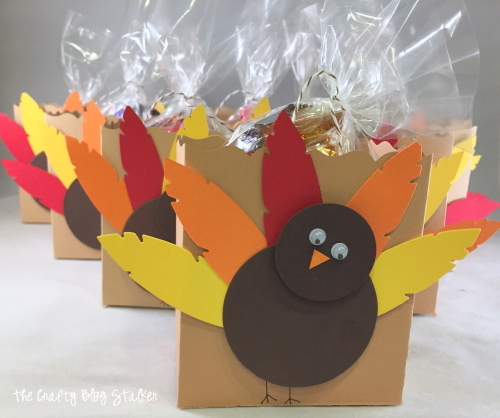 Decorate your place settings with cute Turkey Treat Bags. 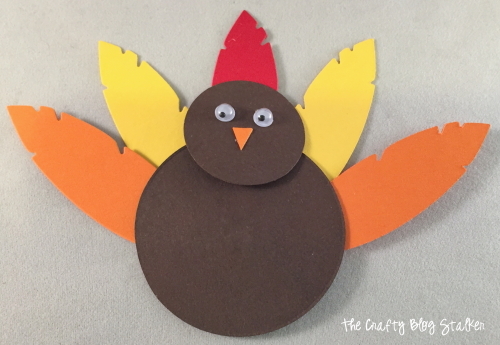 Simple to make and fun to give. Share a little Thanksgiving treat with friends and neighbors. Thanksgiving is this week!! Bring on the turkey! Literally. 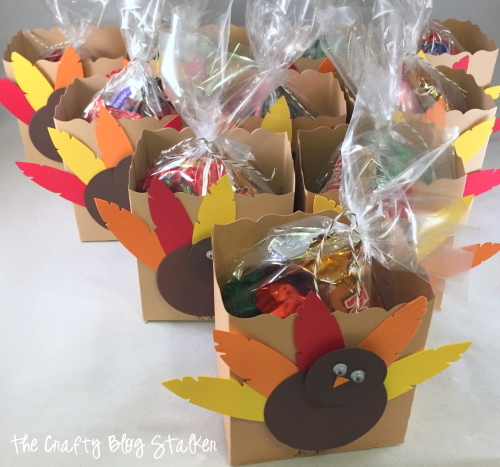 With these fun Turkey Treat Bags you can give a little Thanksgiving cheer to all your friends, neighbors, coworkers and teachers. I love to give my coworkers a fun little surprise on the holidays, so I bet you’ll never guess what they are going to get this week. 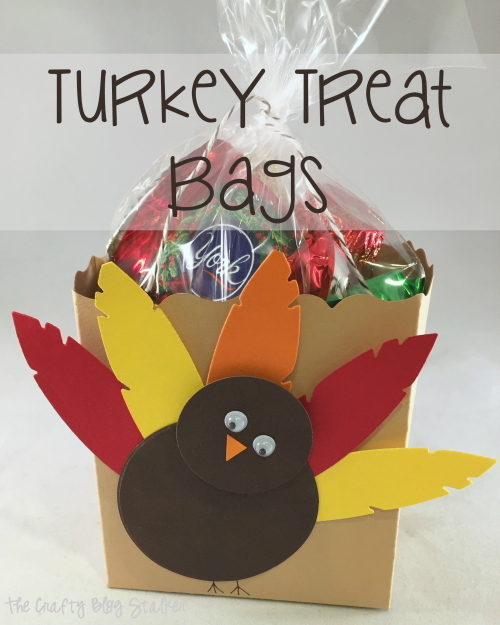 These Turkey Treat Bags came together really quickly and I was able to use what I had on hand. So take a look around your craft room. If you don’t have the same exact supplies as me I bet you have something else that will work just as good. I love my Big Shot. It is a die cutting machine that uses steel rule dies. IF you have never heard of it I highly suggest you look it up. I am using mine all of the time. 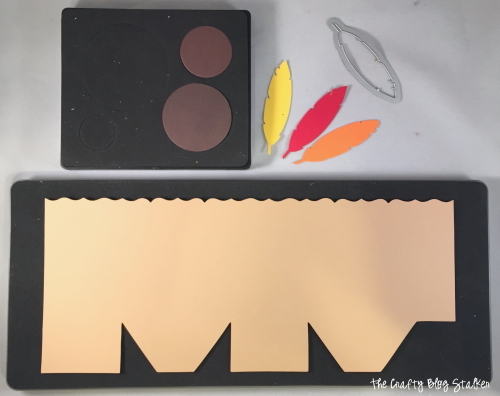 Here are the different pieces I cut out using my Big Shot and Dies. The larger tan piece is actually the bag, it goes together perfectly when folded and glued. Assembling the pieces together is the fun part. I love making cute little critters out of different shapes of paper. Isn’t my Turkey cute. After my Turkeys were finished I glued them onto the front of the assembled bags. Added some mini candy bars into a cellophane bag and tied it off with some Baker’s Twine. Aren’t they cute?! I sure hope my friends at work like them too. Those are super cute! I might have to make some for the kids at my little guy’s daycare! What cute turkey bags. The kids will love them. Thank you Beverly! They were fun to make! This is super cute! If I hadn’t gone with a simple I am thankful for you because…. cards this year This would definitely have been a contender for a project to do with the kids! Thanks for sharing! Yes, these are super cute! Thanks for sharing them with us at Funtastic Friday! Super cute. Thank you for sharing the pattern too!